Interstate 65 dissects the state of Alabama right down the middle until south of Montgomery when it tails off westward toward Mobile Bay. It's there, south of the Alabama River that many of the oak and hickory trees have a kind of moss the color of a wasp nest, that hangs from the limbs like gray beards. You can't see the moss in summer because of the leaves, so I'm not sure if it's green too, but in autumn when the leaves fall, the trees with moss look like wise old men. A few years ago when I drove to the bottom corner of Alabama to do an interview for one of the papers I write for, I took the slow route home. At one point I passed an old barn, and found the scene so striking that I pulled over and took pictures. Outside the truck, I could hear the wind whispering through the trees and see the moss gently swaying on the breeze. Standing there made me feel almost as if I'd stepped back into an earlier time before Interstate highways and mobile communications. I saw the gray bearded trees when we drove to the beach a few weeks ago, and I thought about the old barn. Tonight as I clicked through my photos, I came across this picture. 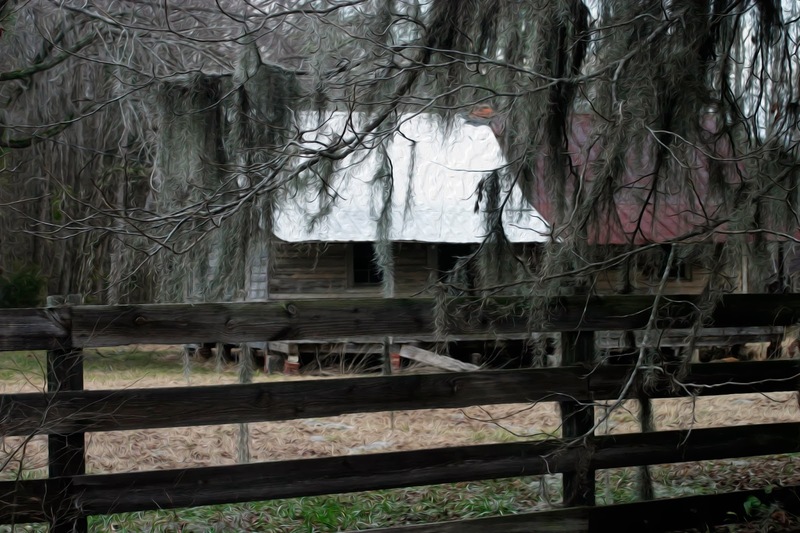 I love barns....old homes....and Spanish moss. I love the moss on the trees in the south, especially on those we saw at one of the plantations. It's just one more thing I love about the south. It does have its own distinct character...you're right! The first time I saw Spanish moss was in the winter. Someone told me is was "Spanish moss," and so it has remained. You're stirring up memories, I remember seeing it also, covering the branches over the roads as I was driving through. Looked spooky but had that ole south charm. Not sure if it makes me feel nostalgic and sentimental, or sad because it is alone. We have a lot of Spanish moss here. Favorite Young Man told me not to touch it. I don't know why, but I always obey FYB.